Killaloe, County Clare derives its name from St Molua, a sixth century monk about whom – like many other religious of the period – relatively little is known. Believed to have been a contemporary of Saints Columba and Gall, and like them trained in the monastery at Bangor, County Down, his original name was Lughaidh, pronounced Lua, and it is from this that Killaloe – Cill-da-Lua , the Church of Lua – comes. Molua’s original church was on Friar’s Island nearby but at the end of the 1920s during the Shannon Electrification Scheme, water levels here were raised meaning the island was submerged. A little 10th/11th century oratory there which was associated with Molua was dismantled and moved to the mainland where reconstructed in the grounds of the local Roman Catholic church. Molua is said to have settled in what is now Killaloe on the western side of Lough Derg and a monastic community grew up around him. Among his foremost students was Flannán mac Toirrdelbaig, son of local chieftain Turlough of Thomond. Flannán became abbot of the house at Killaloe, and the cathedral there still bears his name. 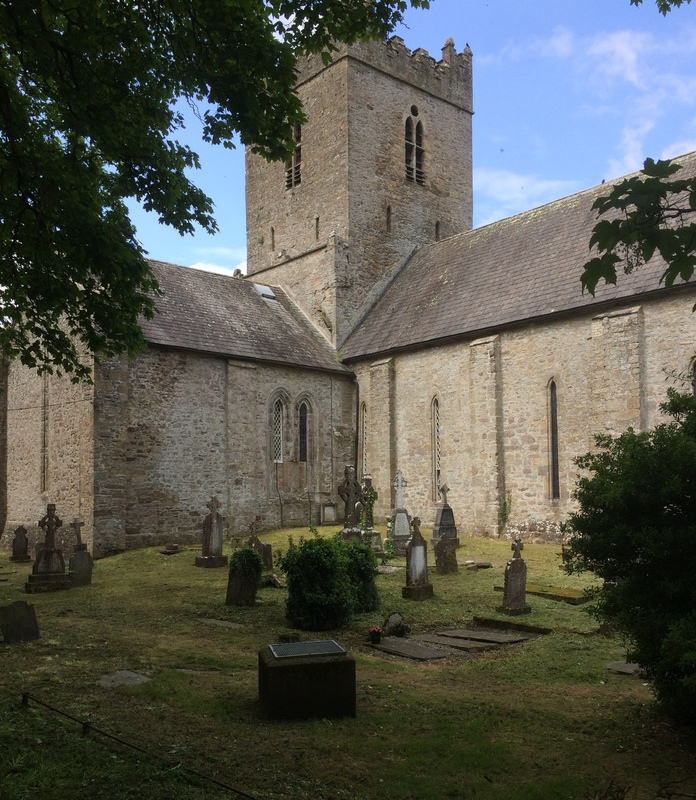 The core of the present St Flannan’s Cathedral originates from the early 12th century when constructed on the instructions of Donal Mór O’Brien, descendant of Brian Boru and last claimant to the title of King of Munster. It will be remembered that O’Brien was also responsible for founding St Mary’s Cathedral, Limerick which this year is celebrating its 850th birthday (see A Significant Anniversary, July 2nd 2018). However, this was soon replaced by another building, most of which can still be seen today and which represents the transition from Romanesque to Gothic architecture. The central arch of the great east window, for example, is round while those on either side are pointed. Unlike many other churches and cathedrals in Ireland, St Flannan’s seems to have survived relatively unscathed from the various upheavals that took place in Ireland over successive centuries: any changes that were made to the structure occurred during times of peace. The great tower was raised twice, in 1775 and 1892 and it was on one of these occasions that castellations were added to the roofline. The glazed oak screen dividing nave and chancel was constructed in the 1880s, primarily to conserve heat for the small local congregation. St Flannan’s contains a number of fine features, not least a well-preserved Romanesque doorway dating from the 12th century: this may be a survivor from Donal Mór O’Brien’s original cathedral. This was not the doorway’s original location: it was reconstructed here in the early 18th century to mark the reputed burial spot of Muircheartach O’Brien, King of Munster, who died while on pilgrimage to Killaloe in 1119. The carving is especially fine, with chevron patterns on three of the arch rings, while others are decorated with fantastical animal and floral ornamentation. The nave also contains a 12th century High Cross; again this is not original to the building but was brought to this part of the county from Kilfenora in 1821 by Richard Mant who the year before had been consecrated bishop; a keen historian and archaeologist, he would go on to write a two-volume History of the Church in Ireland. Initially the cross stood in the grounds of the nearby Episcopal residence; it was moved to the cathedral only in 1934. The rectangular stone font is original to the building and dates from the 13th century. St Flannan’s is another of Ireland’s ‘pocket’ cathedrals, no larger than the average parish church in other countries but an important survivor from a time when there were many more bishoprics than is the case today: seemingly the Synod of Ráth Breasail (1111) was attended by more than fifty bishops, and it then determined that there should be 24. Today there are half that number in the Church of Ireland (the Roman Catholic church meanwhile has 26).